Watch a pair of piano players go head-to-head at Que d’Keys Dueling Piano Bar in Charleston, as you sing, dance, and clap along. Choose between two nightly shows, with the option to add a 3-course dinner of Southern fare made with fresh and local ingredients. Make your way to Que d’Keys Dueling Piano Bar in downtown Charleston, close to some of the city’s best bars, cafes, and attractions, and convenient to public transport. Shows are held at 7pm and 9pm from Thursday through Saturday: be prepared to hear classic hits, show tunes, pop music, and country favorites that are fun to sing along to, as two pianists play and sing in friendly competition. Drinks are available from the onsite Que d'Keys bar, and the bartenders get into the act as well, dancing to the music while they pour beer, wine, and mixed drinks. 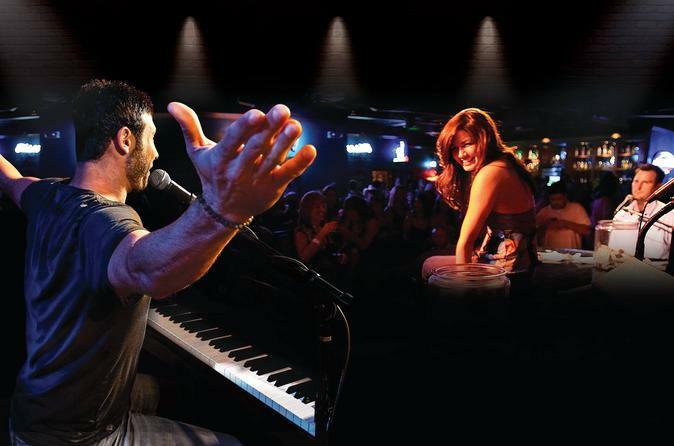 Book the Dueling Piano Bar experience on its own, or make a night of it with dinner at Eli’s Table, a Southern-style restaurant that’s walking distance from Que d'Keys Piano Bar. Dine on a three course menu of food that ranges from shrimp and grits, fried green tomatoes, and gourmet macaroni and cheese to internationally-influenced recipes with Southern flair.